These try-tastic man-sized socks have been designed and donated to p/hop by our talented supporter Sadie Slater aka Whitehart. These men’s socks, with a pattern of rugby goalposts, have a good stretch and will look great knitted in your team colours, or in browns and greens to look like a rugby pitch using your scrummiest yarn! Convert your love of knitting into life-saving changes for people living in dire conditions. 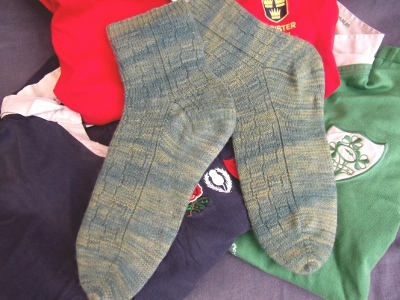 If you like Try Again Socks you might also be interested in Sadie’s other p/hop pattern, the beautiful Tzenni socks. To see what others have made from this pattern, please visit the Try Again Socks pattern page on Ravelry. Browse our our other p/hop knitting patterns and p/hop crochet patterns. To keep up-to-date with the latest p/hop news including new pattern announcements follow us on twitter, join the p/hop group on Ravelry, like us on facebook, or bookmark this website.